I knew right away this was going to be a once-in-a-lifetime lunch, even though my wife and I have enjoyed many spectacular meals at Eleven Madison Park over the years. As much as I enjoy reviewing wines critically, it is a job that inevitably involves tasting a lot of wines. Sometimes, it is nice to spend a few hours with one or two wines. That’s what this lunch was all about. These weren’t just any wines, though, but three great 2009s from one of my favorite domaines in Burgundy. Of course, the 2009s are objects of desire among the world’s most passionate collectors. Prices have skyrocketed since these wines were released, making them virtually unattainable for mere mortals. I doubt I will ever taste – let alone drink – these three great wines together again, but once was enough to get a good look at them. As it turns out, at least one of the dishes we were served was likely an experiment in Eleven Madison Park’s transition to their recently introduced New York City-inspired tasting menu. The ‘Sturgeon’ was more like a deconstructed Brooklyn bagel. But the best bagel you have ever had. The accompanying tin of caviar disappeared pretty quickly. 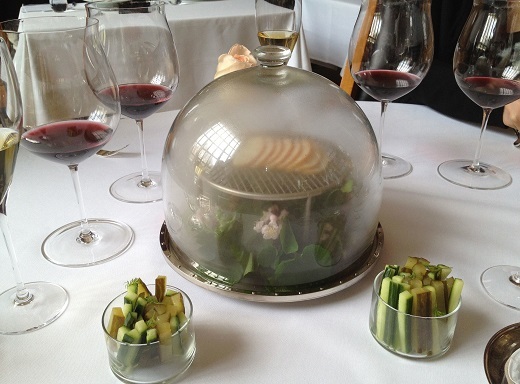 The dish was every bit as delicious as its presentation (in a smoke filled dome) was dramatic. The rest of our courses were a bit less showy, but equally delicious. Daniel Humm is one of the very few chefs I know who plays in all dimensions. Most of these dishes were built on contrasts of temperature, texture and flavor. All of them were visually arresting. As for the wines, well, they were pretty spectacular. How many times will a lunch start with a Roumier Musigny? Not too often for me, that is for sure. I adored the 2009 Musigny when I tasted it from barrel. Frankly, I was quite a bit less impressed with the bottle I tasted at the domaine in November 2011. Despite Christophe Roumier’s assertion that the bottle was fine, I had a very different opinion. The only way to know for sure was to buy a bottle. We followed the 2009 Musigny and the Bonnes-Mares for several hours, a fascinating and thrilling experience in every way. 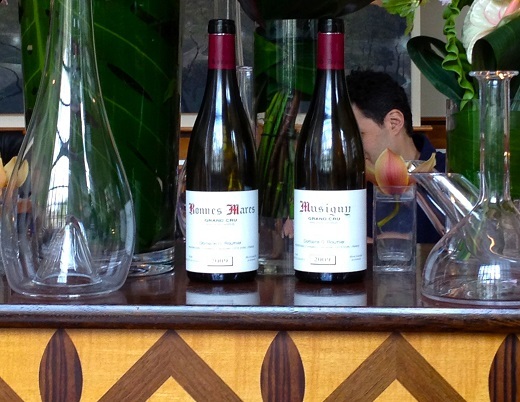 The 2009 Musigny was pure seduction. Silky, sensual and intensely perfumed, it captivated all of the senses with pure pleasure and an intricate latticework of aromas and flavors that seemed to have no end. Then came the 2009 Bonnes-Mares. What a wine! While the Musigny showed more of a red fruit profile, the Bonnes-Mares was quite a bit darker. It also had a lot more underlying structure. With time in the glass, hints of menthol, tar and dried roses added complexity. Both wines took us on a journey. Ultimately, though, the Musigny gave up its charms easier, while the Bonnes-Mares continued to open up over several hours, seemingly with something new to say with each taste. It was flat-out monumental. The stuff dreams are made of. 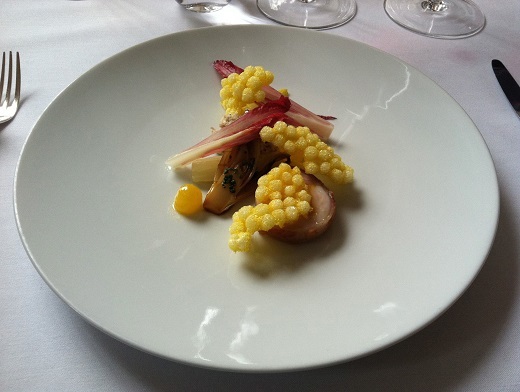 The 2009 Corton-Charlemagne, always a middle of the road performer at the domaine, was surprisingly outstanding, and had no problem being served after the two flagship grand crus. Stylistically, Roumier has worked to give the wine more focus and delineation, and that served him very well in 2009. Rich and textured, the Corton-Charlemagne, deftly balanced the generosity of the year with plenty of vibrant, incisive minerality. What more can I say? 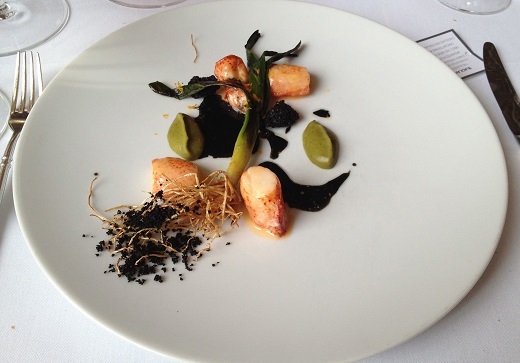 A brilliant menu for Daniel Humm and his team paired with three monumental wines from Christophe Roumier. I can’t imagine there are too many better ways to spend an afternoon. 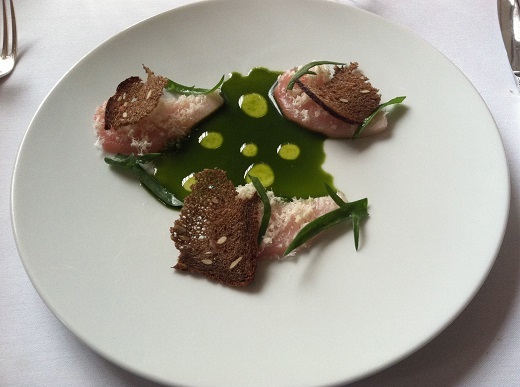 I left Eleven Madison Park inspired and energized, and there simply aren’t too many restaurants I can say that about.